What is it about Mexican food that just feels so right?! 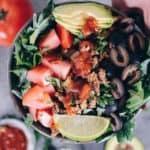 I could eat tacos, taco bowls, enchilada soup, this Paleo enchilada casserole or really any other variety of Mexican flavored food every day of the week. I mean, it’s good to live it up on Taco Tuesday each week, but I could really go for it Every. Single Day. Are you that way, too? Is that a thing? I used to love enchiladas pre-Paleo life, but have yet to re-create a Paleo-fied version. But….we did create this Paleo enchilada casserole, which is pretty much the next best thing. It combines two of my favorite things – Mexican flavors and cornbread (but without the corn)! Wait. What?! You read that right! 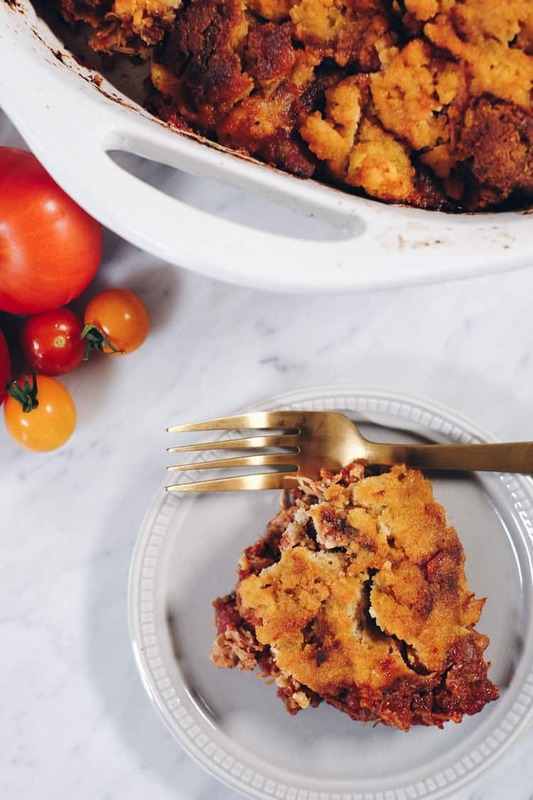 This casserole has a layer of Paleo cornbread on top, and it is dang good! Well, our friend Jessica over at Jay’s Baking Me Crazy made this to-die-for Paleo cornbread chili pie, and both Justin and I couldn’t get enough. We’ve made it several times, and it never gets old! We apparently just couldn’t get over how great of an idea it was. 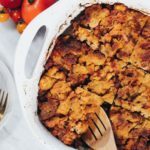 Then, a little later last year we made our crockpot/instant pot chicken enchilada soup, which gave us all the warm and fuzzies Mexican foods tends to do, and I thought huh – how about making that a casserole with a cornbread topping, kind of like Jessica’s Paleo cornbread chili pie? And that is how this delicious Paleo enchilada casserole was born. We made it several times last year and decided we just had to finally post it this year! To make the enchilada chicken, you can use either your Crockpot or Instant Pot. 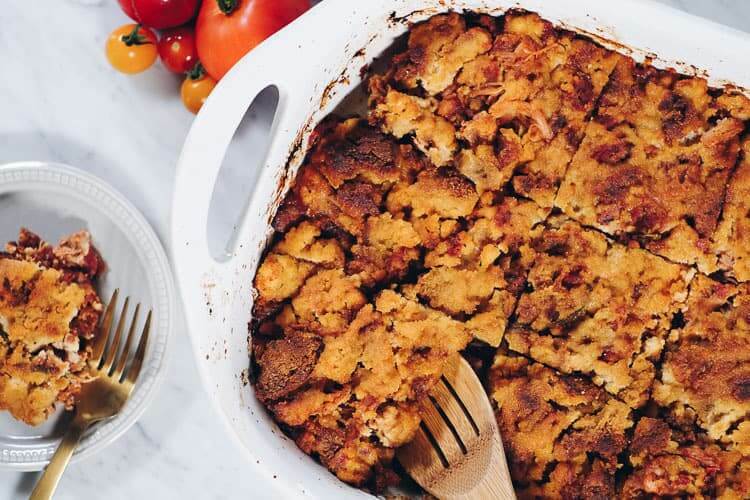 We like to use the Instant Pot for this recipe because once the chicken is done you have to transfer to a baking dish and spread the cornbread topping over it to then bake in the oven. 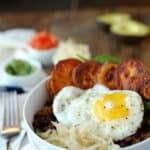 Using the Instant Pot just cuts out time and makes the whole process quicker to throw together if you’re doing it all in one night. You could also make the chicken separately and just refrigerate and then do the baking part the night you want to enjoy it. 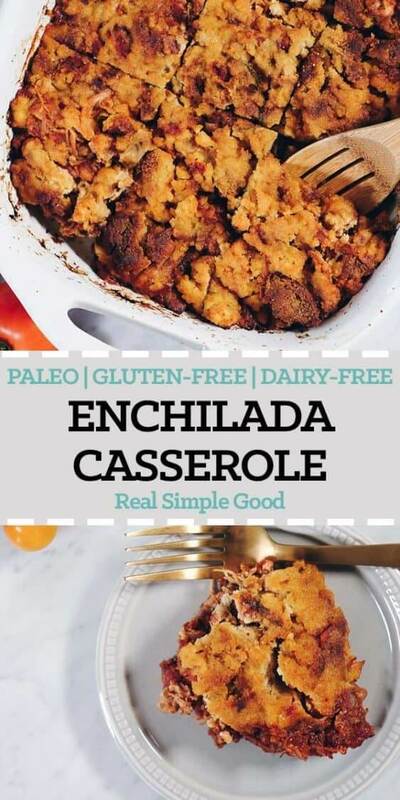 Either way, get this Paleo enchilada casserole on your radar! It will be a new favorite! 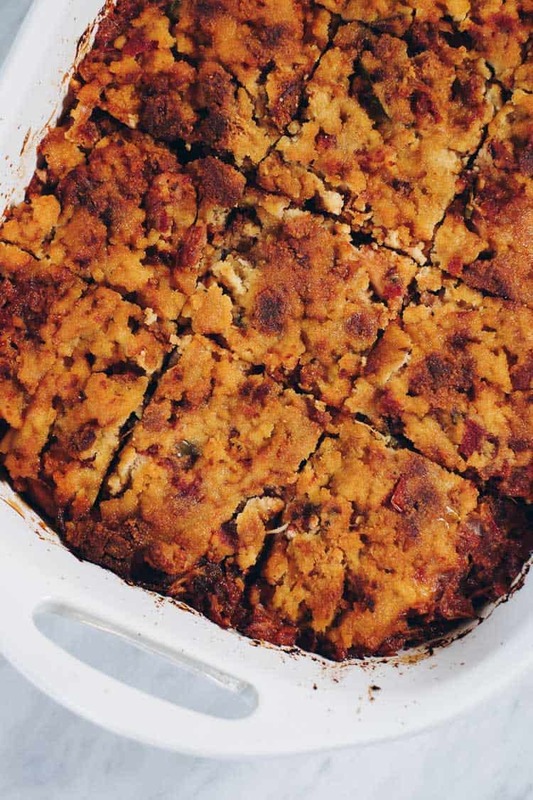 Hurry and make this Paleo enchilada casserole. 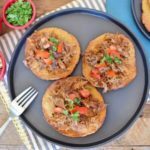 You will LOVE the combo of the Mexican flavors with the cornbread topping! Let us know how it goes by leaving a comment below. Also, take a photo and tag us on Instagram @realsimplegood, so we can check it out! 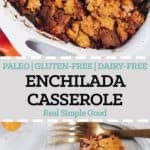 This Paleo enchilada casserole combines two of my favorite things - Mexican flavors and cornbread (but without the corn)! 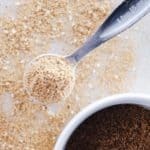 Totally grain-free and delicious! Prep the bell pepper, onion and garlic as noted. Then place all of the crockpot ingredients in your crockpot or instant pot. Cook in crockpot on low for 6 hours, on high for 3 hours or for 20 minutes in the instant pot. About 45 minutes before you're ready to eat, preheat oven to 350° Fahrenheit and grease a casserole dish. Place all of the cornbread topping ingredients in a large mixing bowl. Use a fork to mix and combine the ingredients. When the crockpot or instant pot is done, remove the lid and use two forks to shred the chicken. 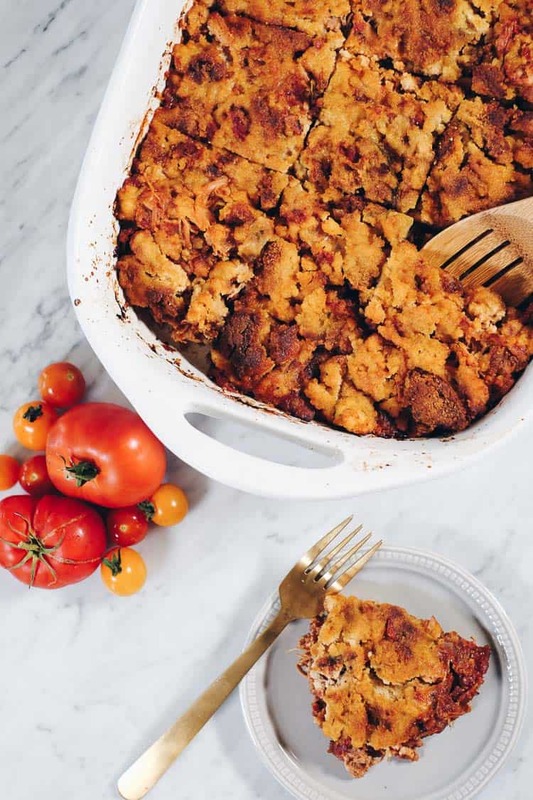 Scoop everything into a casserole dish. Spread out the cornbread topping over the chicken mixture. Use the back of a spoon or your hands to spread the mixture out evenly over the chicken. It doesn't have to cover every bit as the dough will expand when it bakes. Place in the oven to bake for 35-40 minutes until the cornbread topping starts to brown. Once done, remove from the oven and serve. 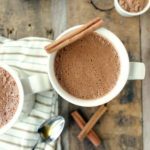 This is now one of my favorite recipes! The “cornbread” is perfectly sweet and goes so well with the smoky flavor of the casserole. 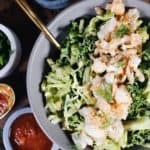 My husband could not believe it was healthy food because it tasted so good ( a common reaction to all the recipes I make from RSG). The only thing I didn’t like was the fight we got into over who got to take the leftovers to work the next day! Thank you both for all your hard work in making healthy food easy, fun and delicious!!! Thanks Courtney! We agree this is a tasty one :). This one took a little prep, but I used a mandolin to cut the onions and thank god I did. The dish came out perfect. My husband and I love the topping too.